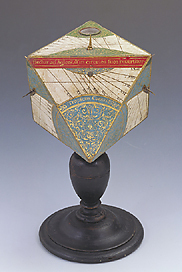 This table-top sundial is in the form of a regular octahedron, with fine decorations in blue, red and gold. It is calibrated for a latitude of 43? 30', corresponding approximately to the cities of Florence and Pisa. The hour lines are traced on each face according to the various dial types present: horizontal, declining, etc. A small compass is housed in a cup in the upper surface. Although the instrument is unsigned, the way in which it is decorated and constructed suggest its attribution to Stefano Buonsignori, an Olivetan friar in the service of Francesco I de' Medici.